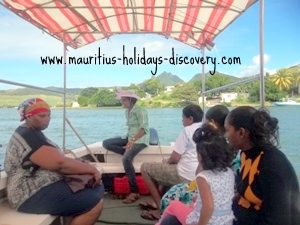 The coast of south east Mauritius is indeed very atypical, but a trip along its meandering road across rustic villages at the feet of Bambou Mountain range is simply superb and mind blowing. Here you won’t find beaches with long strand of soft powdery sand and turquoise sea water. The only exceptions are Trou d’Eau Douce and Pointe d’Esny-Blue Bay, the two extremities of the coastline. 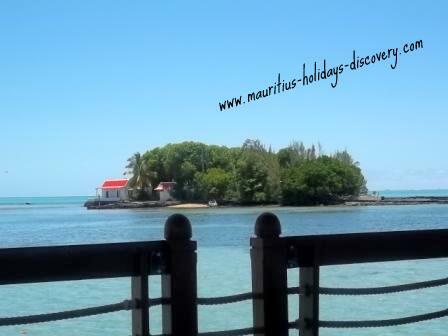 Trou d’Eau Douce is a huge crowd puller, but much more as an embarkation spot for excursions to Ile Aux Cerfs than for its wonderful beach. Speed boats and catamarans will incessantly carry excursionists to the gorgeous offshore islet for a full day picnic there. The deep blue sea water of Blue Bay really matches its name. The beach is quite small, but comfy and lively. Beach restaurants and ice cream trucks jingling around enhance the natural jovial atmosphere. Part of the bay is a protected marine park. You can board glass-bottom boats for a ride there and admire the beauty of colorful corals and tropical fish. A delimited area of the gin-like clear water for the sublime pleasure of those who like snorkeling borders the park. A very remarkable rudimentary spot of the coast is Grand River South East. 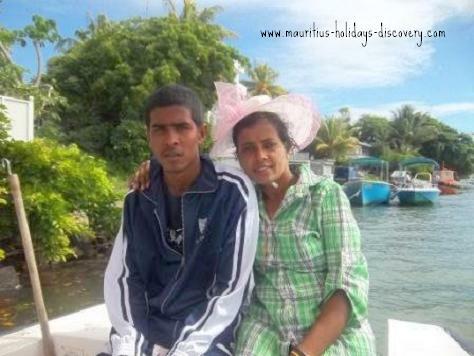 Roumila is an amazing person of this beach village who cannot miss to inspire you with admiration. The cheerfulness and good nature of Roumila are the first things that will strike you. A smartly dressed mother of two sons and one daughter – Luv, Akshay and Anisha – she is a licensed skipper relaying back and forth the two villages of Grand River South East and Deux Freres (named Village of Acceptance with motto “Accepting Others Brings Serenity and Freedom”) in her small boat across the estuary. On her feet as from four in the morning, she’ll passionately take her job at six after catering for the needs of her family. With sparkling eyes she’ll tell you that she works 12 hours daily, the whole year. Don’t expect her to take a break or holidays. That would smudge her pleasure. The only time she would stay at home is when there is a cyclone in Mauritius. Indeed her charisma is striking and she is always on the alert to extend her help to anyone. In a smooth alternating flow of Creole and Bhojpuri, Roumila Maunick would wittily interact with the villagers. When I asked Mrs. Maunick how she came to take that job I immediately felt, through her faint saddened look, a slight emotional bounce back in time. A few years earlier her husband passed away just shortly after buying a new boat. 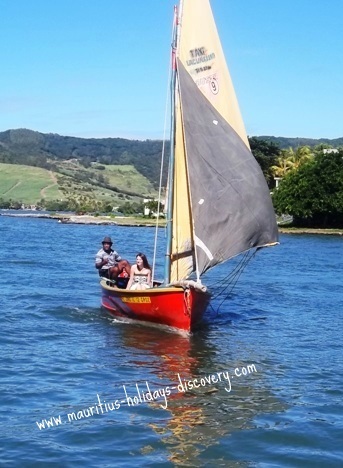 To earn her living she successfully bid for a tender to ferry passengers across the estuary. Since then the joy of her “passengers”, as she would affectionately called the village folks who daily travel with her, procures her a deep sense of fulfillment and contribution. In January 1702, The Speaker commanded by pirate John Bowen wrecked at the mouth of Grand River South East. At that time Mauritius was a Dutch colony and governor Deodati treated him well. In any case the little Dutch force of 52 men was no match to Bowen’s well armed and trained ruffians. 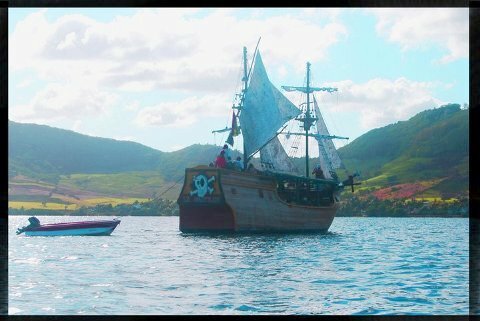 When the pirate left Mauritius he gave the wreck of The Speaker, a French vessel owned by an English company interested in the slave trade, with all guns and stores as a parting gift to Deodati. Artifacts found on the wrecked ship are displayed at the National History Museum of Mauritius, Mahébourg. Further down the coast at Pointe du Diable (literally The Devil’s Point), the scenery is no less spectacular. Now a wonderful viewpoint, the spot was once a coastal artillery location. 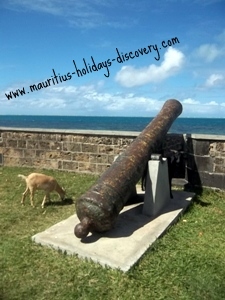 Ruins of French batteries bear witness to the reminiscences of the French Colonial Rule in Mauritius. They were erected to protect the island from British attacks. Mauritius was seriously eyed by the British Empire due to its strategic location. It is here that Captain Willoughby landed, a few days prior to the Naval Battle of Grand Port, trying to corrode the local population’s mind into joining his army to fight the French Colonists. Alongside the relics, you’ll also see ruins of 1939-45 war buildings on top of the promontory overlooking the south east coast. The Dutch were first people to settle in Mauritius. They discovered the island and landed at Vieux Grand Port (Village of Joy – motto: Joy is not in Things; It is in us) in 1598. Eventually, the Hollanders established their headquarters in that region. The Frederik Hendrik Museum fully documents the period when Mauritius was a Dutch colony and displays artifacts excavated nearby. Mahébourg (Village of Flexibility – motto: Be Strong and Supple like the Bamboo) is a town I really love much for its natural beauty, the warmth of its population and prominent cultural diversity. A very subtle nostalgic French colonial atmosphere infuses the place. Indeed a visit to the Biscuiterie H Rault will hint you about the prevailing French lifestyle during that colonial period. My trip along the south east coast of Mauritius not only turned out to be a real blast. I also felt like a fabulous time-travel back in the historical dimension of those who peopled our beautiful island.